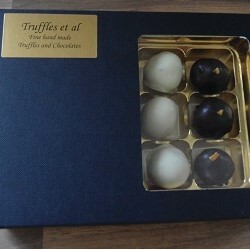 ‘Truffles et al’ are a local business producing high quality hand made Belgian chocolate truffles for Events, Parties, Weddings, Christenings, Christmas or just for pure indulgence. Sam Bouton produces all of the truffles from her home at Hill Farm using local produce when and where available, for example Marybelle Cream. Flavours, subject to seasonal variation include; Stem ginger, Morello cherry, orange Cointreau, filter Colombian coffee, raspberry Prosecco, Madagascan vanilla, rum and raisin, Agen prune, Armagnac, strawberries & cream, mint and Sloe gin. Prices start from £6.99 for a mixed flavour box of eight, with Wedding Favours starting at £2.45 each, for two truffles in a textured box, delivery free to local area. Orders taken by calling in advance or via the ‘Truffles et al’ Facebook page, for collection from Hill Farm by arrangement or by post. Sam attends a great many local foodie events and appears in-shop at both Slate Deli in Aldeburgh and Orford Market. So keep an eye out for her and her truffles as you visit local outlets. There are no nuts used in any of the truffles and the chocolate fridge is separate from others in her home. Please contact Sam if you have dietary or special requirements.